The Enpress NFS-PL20/10-HF is a dual gradient pleated filter designed for the Enpress Cartridge Tank Filtration System. 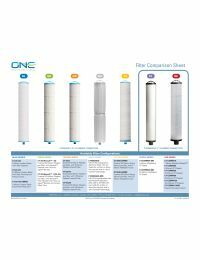 This filter features an external 20 micron pre-filtration layer and a 10 micron internal layer. The internal layer is smaller and will extend the level of contamination reduction while achieving high flow and low pressure drop. The NFS-PL20/10-HF function like a sediment filter to remove silt, rust, and other particulates. The Orange Series filters provide lower shear water velocity as the raw water passes through the filter, allowing for more contact time and interaction with the extensive surface area of the filter. This results in higher water quality and longer life of the filtration system.